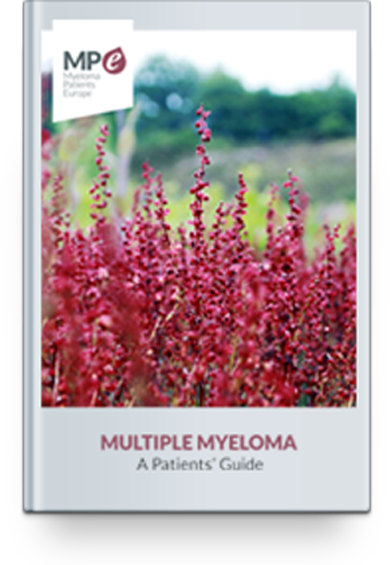 Treatment of myeloma has three key aims: to stop or slow the progression of myeloma, to encourage and prolong the stable periods (remissions), during which only monitoring is needed, and to improve quality of life, e.g. by relieving symptoms. At the time of diagnosis, you may not be experiencing any symptoms at all – this is asymptomatic or smoldering myeloma. Patients with symptoms, or those who are likely to develop symptoms in the near future, need treatment. Many different types of medication are available. The exact choice will depend on many factors, including how old and how fit or unfit you are. Younger patients who are relatively well will be offered higher doses of drug treatments, followed by intensive treatment with chemotherapy to eliminate the abnormal plasma cells, and stem cell transplantation to replace them with healthy stem cells. People aged over about 70, and those who are less able to tolerate the side-effects of intensive treatment, are more likely to be given a combination of drugs but no chemotherapy or stem cell transplant, although a transplant is possible provided it is with their own cells (see section 4.2.3). This is because any side-effects of intensive treatment would be harder to cope with. Other types of treatments, such as radiation therapy and surgery, may be needed according to particular circumstances. Treatment comes in phases, which are described in the following sections. If you have smoldering myeloma, your treatment will simply consist of active surveillance, which means being watched closely. Your doctor may recommend starting treatment if you are at risk of developing symptoms within 18 months to two years. Before that, if your bone density is relatively low and you have any indications of bone damage (osteoporosis or osteopaenia), you may be prescribed bisphosphonates to slow it down. If you have been diagnosed with MGUS (monoclonal gammopathy of unknown significance), you will also be monitored regularly for any health changes. One or more of the newer anti-myeloma treatments including thalidomide (Thalidomide), lenalidomide (Revlimid) and pomalidomide (Pomalyst) which enhance the performance of the chemotherapy drugs by boosting the immune system and preventing myeloma cells from surviving. Bortezomib (Velcade) and carfilzomib (Kyprolis) target cells actively producing proteins, principally the abnormal plasma cells. Pain relief as needed; usually non-steroidal anti-inflammatory drugs (NSAIDs). Melphalan – prednisolone – Velcade (VMP). In some cases, induction therapy can remove all abnormal plasma cells, which is called a complete response or complete remission. However treatment will need to be continued, as without it, the myeloma would return. The length of time for which you will need to take the drug combination will be somewhere between 4-6 months, depending on how you respond. The drugs are usually taken for a few days or weeks, followed by several days or weeks without treatment, and then repeating the cycle. This is to allow time for the healthy cells, which may have been damaged by the chemotherapy, to recover. Not everyone will respond to any one combination of drugs, so you will be monitored and another combination can be chosen if the one you have started does not appear to be working for you. After this period of induction therapy, a decision will be made on what comes next. If you are well and in complete remission, and myeloma is your only medical condition, the most likely course is a stem cell transplant with intensive chemotherapy. If you are not very well, or aged over about 70, it is likely that you will not be given a transplant but instead will be offered continued consolidation drug therapy. Both types of transplant will be followed by a prolonged period of maintenance drug therapy. We have seen that some combination drug treatments may not be effective for particular people, and it may be necessary to try a different combination. This is a relapse, and it will occur to everyone with myeloma; often several times. It will be picked up in the results of the diagnostic tests (e.g. your paraprotein level) which you will continue to have regularly. You may also feel that your pain or tiredness are becoming worse. It is understandably disappointing, but there is no reason why another treatment should not work better. It is not a reason to be over-anxious, but it will probably mean a change to the medication you are taking. For some people, a treatment that worked well earlier can be repeated with good results. The same reasoning applies when a treatment that has been effective, no longer appears to work so well (known as refractory myeloma). The first time a relapse happens, most people will be given bortezomib (Velcade). This is given by injection under the skin, once or twice a week. It is usually given in combination with the steroid, dexamethasone, and often with chemotherapy agents, cyclophosphamide or melphalan. The drug most often given at a second relapse is lenalidomide (Revlimid); usually in combination with dexamethasone and cyclophosphamide. Alternatively, it may be possible to have a second stem cell transplant, if you have had a good long period of remission since the first one. Carfilzomib (Kyprolis) is approved in both the US and Europe for treatment following a third relapse, providing patients have previously had at least two cycles of treatment with bortezomib and either lenalidomide or thalidomide, and the disease has become worse in the 60 days since the end of treatment. Elotuzumab (Empliciti); in combination with lenalidomide (Revlimid) and dexamethasone. Daratumumab (Darzalex); as a single agent for patients who have already had three lines of therapy. Further details of these new drugs are given in section 7.1. If you are well and in complete remission, and myeloma is your only medical condition, the most likely course is a stem cell transplant using your own cells (called an autologous stem cell transplant or auto-SCT). It involves collection of stem cells from your bone marrow at the end of induction therapy, and is possible in older, fit people. The first step is drug treatment to stimulate production of stem cells and their movement from the bone marrow into the blood. In the actual transplant, given in hospital, blood is passed through an apheresis machine which separates it into its different components. The stem cells can be removed and all the other components are returned to the body. The stem cells are frozen and retained for use in transplants – usually enough for two occasions. A relatively high dose of the chemotherapy drug melphalan is then given, followed about two days later by the stem cells, which will move into the bone marrow and start to develop into new blood cells. The process can take several weeks, during which it is essential to avoid infection. It is common to feel unwell during this time, and several more weeks of convalescence may be needed after you leave hospital. The great advantage of transplants is that patients usually respond very well and can achieve a long remission period. In relatively rare circumstances, younger, fit people can be offered a transplant of stem cells from other close relatives; usually a brother or sister. This is known as an allogenic transplant. It makes use of the donor’s stem cells to boost the immune response of the person with myeloma, by developing into specialised blood cells that can attack the abnormal plasma cells. This is believed to be the reason why allogenic transplants have a lower rate of relapse than autologous transplants. There is a problem, though, as an allogenic transplant carries the risk of graft-versus-host disease (GVHD), in which the donated cells attack patient’s healthy tissues as well as the abnormal plasma cells. A lower-risk allogenic transplant can be considered, in which a lower chemotherapy dose than usual is given. The transplant is followed by high-dose chemotherapy with melphalan, and recovery over a period of weeks.